In a 2012 building, very modern and comfortable apartment with 1 bedroom, on the 2nd floor with elevator. Living room with a sofa double bed, table and chairs, TV and a modern fully equipped kitchen with dish washer, microwave and electric oven. Bedroom with a double bed, a chest of drawers and a wardrobe. Bathroom with shower, bidet and window. A nice large terrace (the washing machine is here) is facing the peaceful green courtyard. 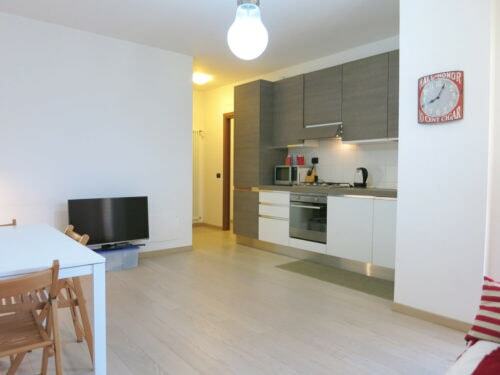 The apartment is located in safe and quiet residential area, near by “Fondazione Prada” museum. Very modern buildings and green areas are rising in front of the building. It will be the headquarters of Google, a futuristic and technologic district where only electric cars are allowed, with parks, apartments and offices. Walking distance there is Lodi M3 metro station, other bus and tram stops, every kind of shop and service. Very convenient to reach Bocconi, but also IED, Marangoni and other universities.